I just wanted to pass along some information on the wonderful book I just read. It was a very interesting, worthwhile read. I highly recommend this thought provoking book. Taking a Shortcut to God? helps Christians exchange rumors of God for a firsthand faith. Dallas/Ft. Worth, TX—We live in a culture of experts. Everywhere one turns, there are professionals touting advice on everything from how to repair your car to how to fix your marriage. And, in Christian circles, some have even started to believe that there are “God experts”—people who can pray in just the right way that God hears them or who worship in such a way as to make God listen. We begin to rely on these people as our sole source of information about God, rather than make the effort to encounter Him directly ourselves. God has offered us firsthand knowledge of His love, His grace, and His power. Yet so often, we too easily settle for someone else’s descriptions, the Cliff notes from another’s spiritual journey. We are content for others to do the heavy lifting and then give us the bottom line. And, like any secondhand information, after enough times through the grapevine, the truth about God deteriorates and crumbs of rumor are all that remain. But when life derails, and things don’t go as we had planned, our thin view of God is challenged. In those critical moments, we can choose to walk away from God, or to let our questions lead us home. When we choose to wrestle with God, to engage Him individually, we—like Jacob and Job and David—will see rumors die and revelation come alive. 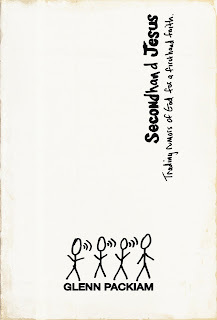 Beginning May 15 and continuing throughout the month of July, the “Hear It First, Read It First” contest and promotion for Secondhand Jesus will be sponsored by David C Cook, Integrity Music, HearItFirst.com, and Gibson/Epiphone Guitars. By visiting HearItFirst.com, fans and readers will be able to win prizes, as well as download a free music video performance of Glenn Packiam (i.e., “Burning in Me”). Glenn Packiam is an associate worship pastor at New Life Church and the director of New Life School of Worship in Colorado Springs, Colorado. He was one of the founding worship leaders and songwriters for the Desperation Band. Glenn’s worship songs, like “Your Name,” “Everyone (Praises),” “My Savior Lives,” and “We Lift You Up,” are being sung in churches all over the world. Glenn is also the author of Butterfly in Brazil. He and his wife, Holly, and their two adorable daughters, Sophia and Norah, live in Colorado Springs.